When you visit our dress studio, you will be welcomed by Elisabeth who is highly experienced in dressing women for special occasions and will make you feel comfortable and relaxed as soon as you arrive. 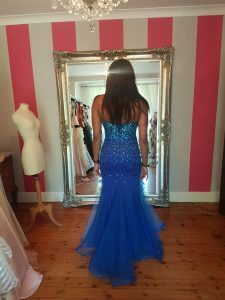 Your fitting will start with a brief conversation about the event that you are attending, and then Elisabeth will show you the collection of dresses. 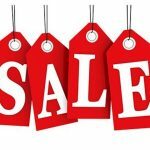 Together we will find the right dress to suit your body shape and the occasion. Your appointment will be approximately 45 minutes long and you will have the freedom to try on a selection of dresses untill you feel satisfied with your choice of dress. 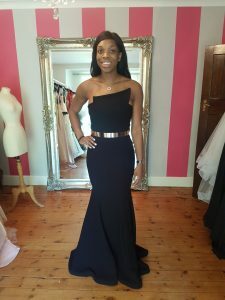 Eboni Beckford-Chambers, Member of the England Netball Team that won the Gold Medal at the 2018 Commonwealth Games, recently received celebrity treatment when she visited us looking for an a dress for the BAFTA Awards at The Royal Festival Hall. 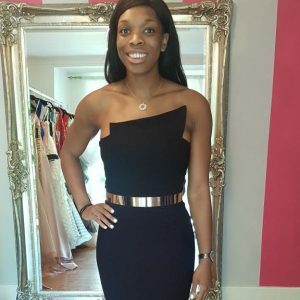 Eboni trusted that she would find something at Having A Ball Dress Hire the moment she read that we had dressed celebrity sports women and was comforted by the customer reviews. 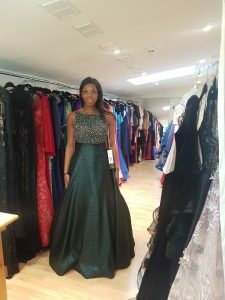 You can see how gorgeous Eboni looked on the day of the BAFTA Awards Ceremony in the photo below and a couple of photos in other dresses she tried on.